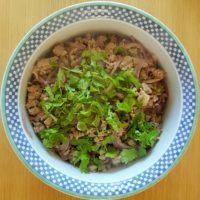 Where is Burma and what is Burmese Food? This is very similar to Mon cooking (Southern State), where my mother was from. The Mon dish however can take up to 4 hours to make, also the Mons will also called this Sein Kaw (Raw salad). They hardly cook it at all, as they marinate the meat for hours with dried sour fruit called mayanthee. The acid from the fruit cooks the meat. When I have a chance, I will make but for now this dish satisfies my craving. Hand mix all ingredients except oil and coriander. Heat up oil in a medium sauce pan until pipping hot, add the salad mixture. Stir until meat is thoroughly brown. This will give out excess liquid. The trick is not too cook too much, onions will start to turn into gravy. Drain excess liquid and set the salad aside. Reduce the liquid until gravy like consistency. Re-add the salad mixture and stir. Best served with rice and veg stir fry. For galangal, use Ocado or any Thai shop.